This year’s most anticipated adaptation of a much-loved children’s book is…well, “Where the Wild Things Are,” Spike Jonze’s take on Maurice Sendak’s largely word-free story of one ornery boy. 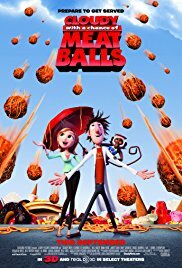 And if the pressure wasn’t already on Jonze to knock “Wild Things” out of the park, it certainly will be after people get a glimpse of “Cloudy with a Chance of Meatballs,” the season’s other adaptation of a much-loved children’s book. “Cloudy” takes the basic premise of the book to insane extremes, like a Roland Emmerich movie with self-awareness and a finely tuned sense of humor. It’s not every day that we see an animated movie that features kittens singing a Public Enemy song, but man, what a wonderful world it would be if we did. The story takes place in Swallow Falls – a word of caution to fans of the book: extreme liberties were taken with the source material – a small island town in the Atlantic Ocean. Flint Lockwood (Bill Hader) is an enthusiastic but largely unsuccessful inventor, and has spent his life trying to come up with something that will make life better for the struggling town. (Their main export is sardines.) His latest idea involves turning water into food, but he doesn’t have enough power to complete the conversion, so he steals some juice from the power plant for his final test, and inadvertently shoots his food maker into the clouds, where it begins raining hamburgers on the town. Flint is suddenly the town’s golden child, but his desire to be liked gets the best of him as he pushes the machine past its capabilities and the machine begins fighting back, unleashing a fury of food storms on the town and, eventually, the world. The filmmakers were very careful to make sure all departments stepped up, rather than coast on star power or gimmicky 3-D effects. The character design is rich and varied (three words: Flint’s father’s unibrow), the set pieces, especially in the movie’s “Armageddon”-ish climax, are beautiful, the casting was straight from Pixar’s playbook – getting the right voice is always more important than getting the famous voice – and some of the movie’s funniest moments come on the downbeat, a testament to good screenwriting. The 3-D work is subtle (no one playing with paddle balls, in other words), and serves to accentuate the story rather than distract the viewer from the absence of one. Lastly, there are the elaborate action sequences, the best of which is a twister scene where Flint takes a Buster Keaton-type trip from one object to another in mid-air. They’re thrilling to watch, and the filmmakers poke fun at disaster movie conventions while paying them loving tribute at the same time. If there is one downside to “Cloudy,” it is the fact that we are reminded with nearly every second of running time that there are Serious Life Lessons for Flint to learn. And while children will benefit from these morals (the most important of which is that it’s better to do the right thing than it is to do the popular thing), the manufactured conflict gets in the way at times. But it’s a small price to pay for a movie with so much personality, especially when it goes to great lengths to comment on the fickle nature of celebrity and the desperate, pathetic things people will do in order to maintain it. For the first time in ages, someone has beaten Pixar at their own game.